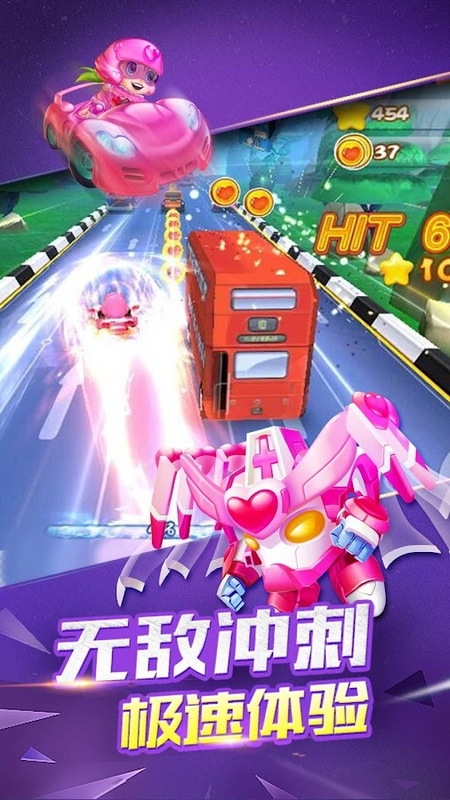 🏁 "Happy hero Speed car" is a popular racing game for googleplay.Five popular characters drive their gorgeous and cool cars,andrace with you in towns, seashores and deserts. 🏁 Betweenthescenes, let you feel the delicate track and natural environmentinthe exciting racing. 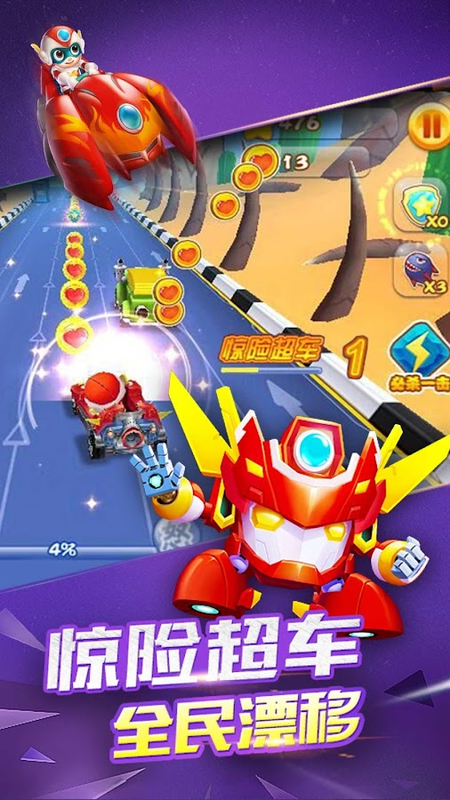 🏁 "Happy hero Speed car" let youflying,rushing, mechs invincible body rampage, a powerful fireattackfull-screen blasting, destruction of all the enemy blockingtheroad!The game features of "Happy hero Speed car":🏆 Transformedintoa motorcycle man, invincible mech is overwhelming!🏆Powerfulfireguard satellite planet!🏆 100% restored animation mecha,turnedmotorcycle man!🏆 Mech powerful firepower, gorgeous combos,destroyall enemies! "Happy hero Speed car" gameplay.🏆 Just by "leftandright" operation you can enjoy the pleasure of galloping onthetrack!🏆 Limit the distance to overtake, stop avoidingobstacles,the limit of cleaning the car to bring unprecedentedunprecedentedrefreshing!🏆 Many ways to develop, a variety ofgameplay freechoice, the game has massive tasks, achievements, etc.youcomplete.🏁 "Happy hero Speed car" is a game that is easy to useandhas depth, exciting gameplay, multiple choices fordevelopingroutes, interesting task achievements, and a variety ofinterestingtips and tricks to be discovered and experienced. 🏁 Payattentionto lane change vehicles and be careful about rear-end!Stickypolice cars will make you want to be crazy! 🏁 Use thejumpingplatform to experience the real thrill of flying!Nitrogeninvincible acceleration, true limit speed! 🐖"Kart Racer - GG Bond Hill Racing" is a kart racing game.Popularbursting animated characters, incarnation of the bravepigman,stunned little dumbfounded, BOSS superman strong, driving acoolracing car on the track and opponents a high low!❤"Kart Racer -GGBond Hill Racing" has various effective props. It canflyopponent's missiles, range explosive missiles, and allowopponentsto rotate the banana skins in place, so that you canexperience thespeed of the fun while experiencing a variety ofprops.❤"Kart Racer- GG Bond Hill Racing" is full of challenges,technology, andopening shots! Enough courage, four missiles fly!Enough tooperate, inside the road to overtake! Passionate enough towin thechampionship!🐖"Kart Racer - GG Bond HillRacing"features:❤Extremely cool: various props, various effects,let youexperience the extreme fun of racing!❤Minimalist: You canenjoy thejoy of galloping on the track just by “right andleft”operation!❤Extremely Hyun: The car turns into a mech, andit'scool! Total Annihilation! 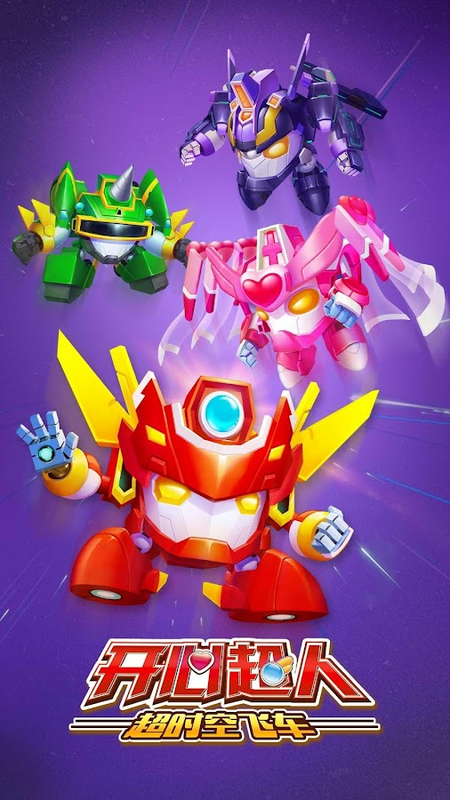 Pig Pig Hero 🐷 🐷 🐷 Is a 3D production of Shaoguan fightingfightingparkour game, in this big adventure, there are bravepigman,handsome Superman, learned Fifi and other characters withyou.🐷Cool special effects highly restore the feeling of animation,andeven more adorable pets can be developed. 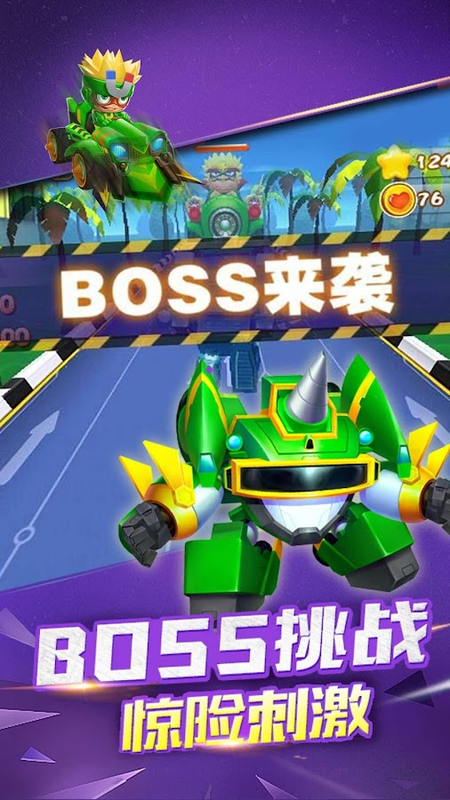 Come try it!Gamefeaturesof Pig Pig Hero:🐽 The screen is beautiful and lovely,colorful andbeautiful, full of playfulness.🐽 The operation issimple and easyto use.🐽 Rich and unique levels, different parkourexperience.🐽Gorgeous special effects, turned into a powerful Wulingguard,fighting to run together to play.🐽 There is also acompleteachievement system at a glance.Pig Pig Hero gameplay:🐽 Intothegame, there will be a novice tutorial, according to the promptstoplay the game just fine;🐽 The process of running can bearbitrarilyjump, be careful of the trap;🐽 Obstacles and monstersare allcapable of flying;🐽 You can use props to help.🐷 "Pig PigHero" is ahigh-quality parkour game. Its character is walking likea rush oflightning in the busy streets. It leaps and jumps in thewhirlingtraffic.🐷 "Pig Pig Hero" allows you to go through a varietyofcomplex terrain obstacles, collect props, pick up gold coinsandexperience speed and passion. 🍌 🍌 🍌 new 10 levels come on, total 100 levels now 🍌 🍌🍌🍌“JungleMonkey Run : Banana Kong adventure” is one of the bestjunglerunning adventure game in google play store.🍌Monkey kong isveryhungry.So he is finding food in the jungle.But There are manymanycrises in the jungle likesavage,spider,fountain,bouncingflowers,and so on.The jungle is sodanger.Please help monkey kongrunning out of the jungle and collectmore bananas.🍌“Jungle MonkeyRun : Banana Kong adventure” Features:-Great photograph and lovelymonkey -Simple control just running andjumping monkey -Break thestone ball and wooden box -Catch treerattan to glide further-Fountain, bouncing flowers can make youjump higher -The bananaleaves can let you slide freely on the water-Continuous click onthe screen can escape the shackles of thespider web -100 differentwonderful levels and more will come.🍌Howto play” “Jungle MonkeyRun : Banana Kong adventure””: -Tap screento jump the monkey.-Long tap screen to let monkey glide. -Kill Oravoid the monster.-Collect bananas as many as you can. -Finish alllevels with 3stars.🍌Great!Download “Jungle Monkey Run : Banana Kongadventure”now! And enjoy this adventure game!! This is a very artistic endless game.In the game, you willcontrolthe two lines in a certain circle.Your response should befastenough to avoid obstacles in time!At the same time, the lineleapis also a test of the player's rapid reaction.In the game,theplayer needs to maintain a high degree of concentration,andimmediately separate or gather to avoid obstacles.As thespeedincreases, the challenge of the game succeedsemerges.Features:• 3different music styles.• 9 incredible songs. •3 difficult levels•Cool graphics and effects!• Better controls andgameplay!